Rotary cutters are a great tool for quilters and crafters to use on all kinds of projects. 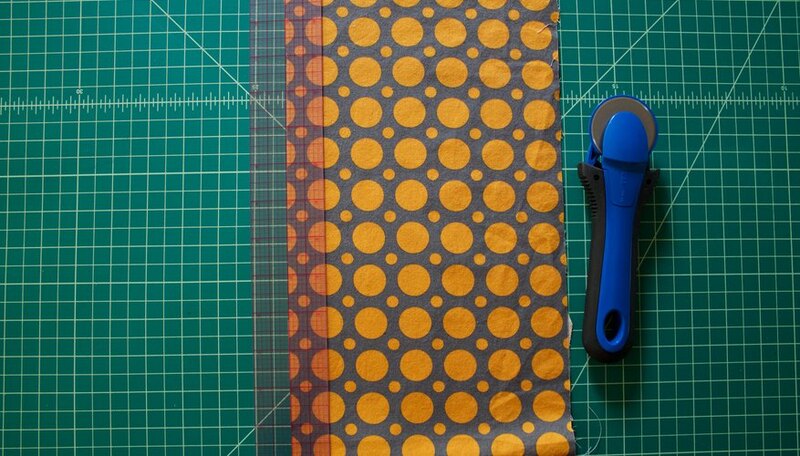 Quickly cut a perfectly straight line and create measured strips and squares of fabric for quilting and sewing. You can also use a rotary cutter on paper to trim photos or artwork to use in a scrapbook. Rotary cutters come in various styles of handles and locking mechanisms. Choose what feels comfortable to you. A self-healing mat is necessary to protect your cutting surface. Most mats come with grid lines to easily measure your fabric. Please see the last slide for an itemized materials list. 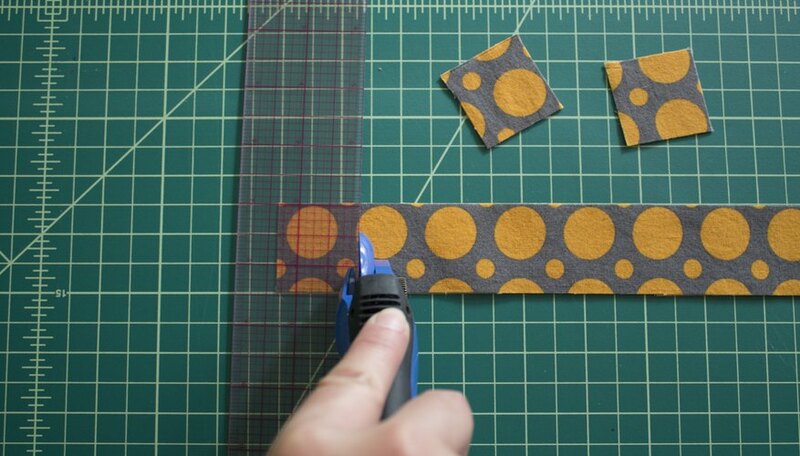 Measure your cut by lining up the edge of the fabric with a line on the self-healing mat. Measure the width you would like to cut by following the lines on the mat. Each line is usually 1/2 inch apart. Line up the ruler with the desired measuring line where the ruler overlaps the fabric. Measure your fabric a different way by using the measurement lines on your ruler as a guide. Line up the edge of the fabric with the measurement you desire. 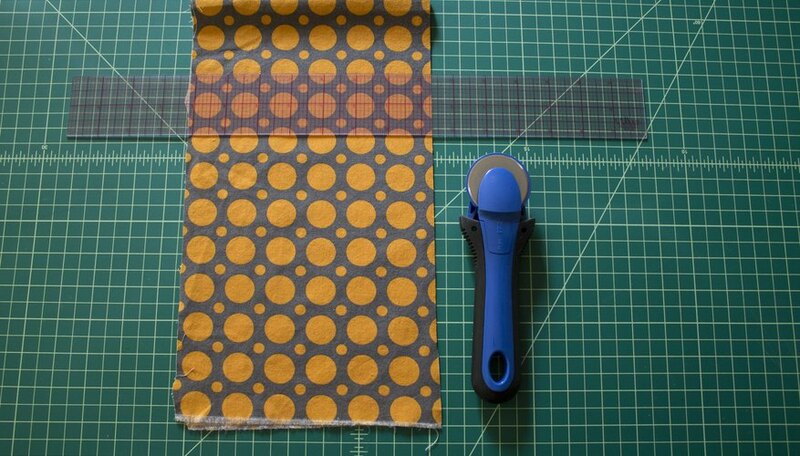 This method is great if your ruler is shorter than the fabric you would like to cut. Grab the rotary cutter firmly in one hand with your index finger on the top of the tool for control. Place your other hand on the ruler to hold the fabric and ruler in place. 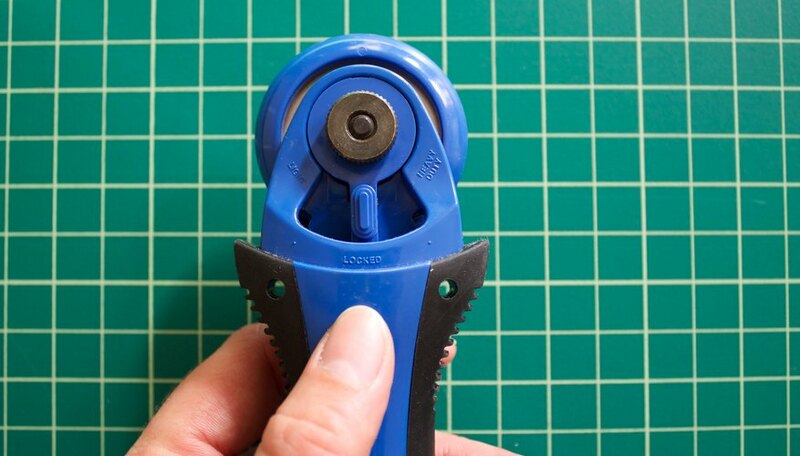 Keep your fingers away from the edge of the ruler so that they are not in the pathway of the rotary cutter. Line up the edge of the blade with the ruler and cut by pushing the blade down and away from your body. 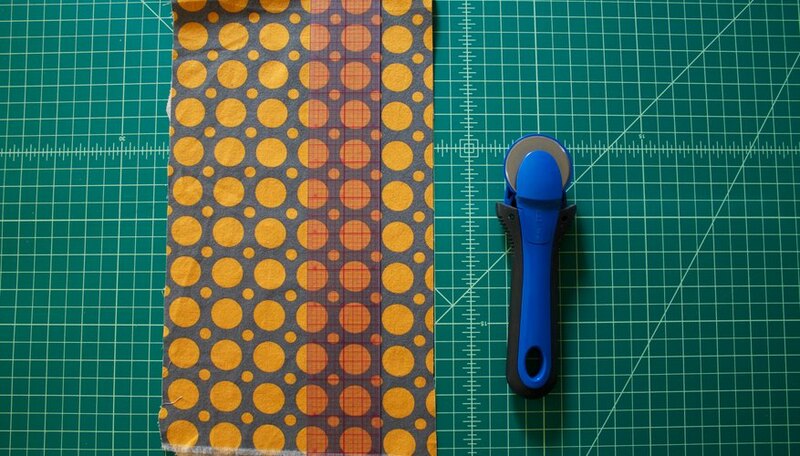 Cut a square by turning the strip of fabric and measure the width with your ruler. 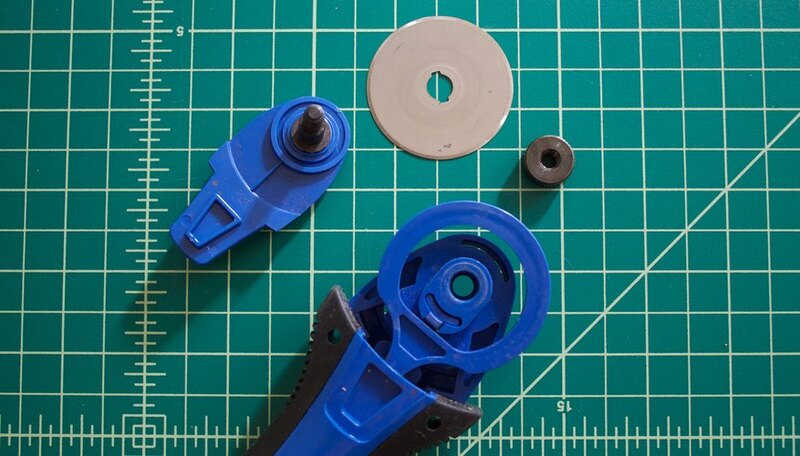 Store your rotary cutter safely by turning the dial to the "locked" position. When you are ready to use the tool, turn the dial to "light" or "heavy duty," depending on your fabric. Most rotary cutters have a safety guard which covers the blade until you press down on the mat to cut. Replace the rotary blade by unscrewing the center screw and remove all parts. Swap the dull blade with a new one and reattach the safety cover and screw. A sharp blade is ideal for cutting with a rotary cutter. If your blade is dull, it may miss a few threads throughout your cut line. Run your blade over the cut line a second time if needed. 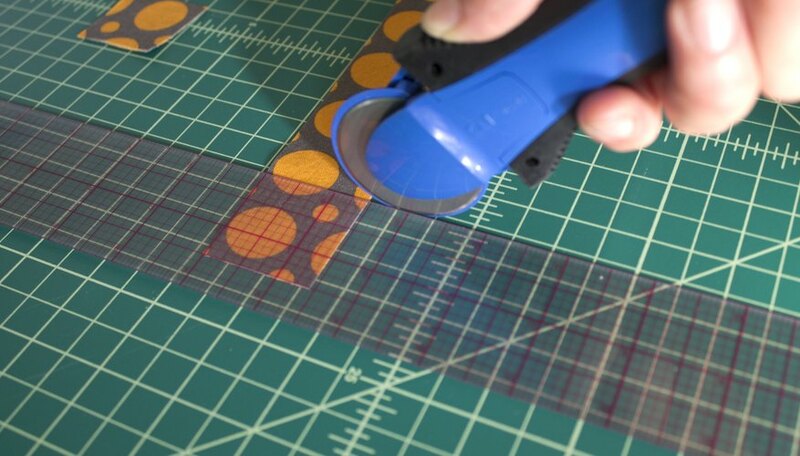 With practice you can use your rotary cutter to cut out curved lines on pattern pieces. Go slowly at first until you get the feel of the rotation. Rotary cutters are sharp. Use your tool safely by going slow, keep your fingers away from the edge of the ruler, and always lock your rotary cutter when not in use.